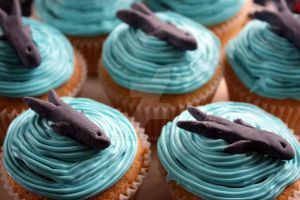 Those look too cute to eat! My two favorite things! Dogs and cupcakes! Well, three things if you include the blue on the cupcake... Great job! This is awesome <3 You're very talented! Seriously, way too cute to eat. These are perhaps the most adorable things I have ever seen. Okay, maybe not "ever," especially compared to the rest of your gallery where there is too much to choose from, but they're seriously adorable. I love how playful even fondant can look. My grandparents used to have a Maltese! These are just so cute! I love the cross design and the little flowers. I want those cupcakes so bad now. So, how much work time is usually put into your cupcakes and how much do you usually sell them for? Just curious. I would imagine that cupcakes of this detail would cost a great deal! GOSH! 15 MINUTES!!!!!! HOw long have you been doing this?! Aw those are adorable! The little bones are a nice touch. They're so sweet I love how them turn their heds.